Know your enemies. Learn the wide variety of Rebel and Imperial troopers. 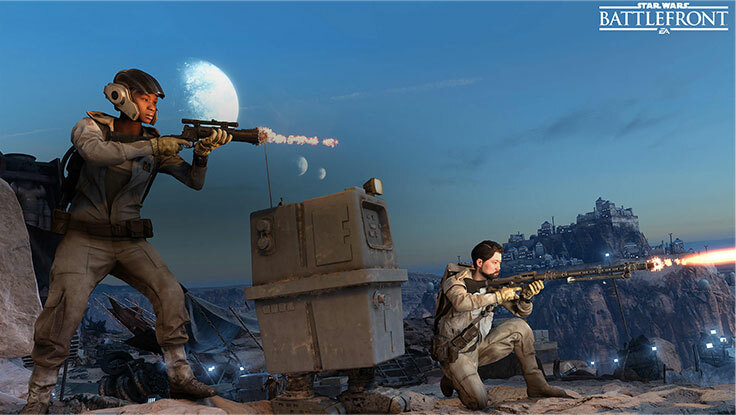 Stormtroopers and rebel soldiers are the all-round enemies of the Star Wars™ Battlefront Missions. Though weaker than other foes you'll encounter, they move fast and can use thermal detonators to flush you out. Equipped with a powerful DLT-19 Heavy Blaster, the fearless shock trooper and Quarren heavy gunner should be considered a real threat. These troops can withstand a lot of blaster damage - and deal a lot of it themselves. Keep a close eye on the battlefront if biker scouts or Rodian snipers are around. Fighting from afar, these troops deal the most damage per shot of any on-foot AI soldier and use Smoke Grenades to remain hidden. Using their jump packs to gain the high ground, these troopers will truly challenge your skills on the battlefront. Even when they're under your blaster fire, the jumptrooper and jetpack soldier can protect themselves with a Burst Shield. Seemingly appearing out of thin air, the Shadow Trooper can be a truly unpleasant surprise using its cloaking device. Be extra observant and stay away from the T-21 Heavy Blaster fire. Keeping a safe distance on the battlefront, the Demolition Trooper and Sullustan Demolition will try to lock-on to you with their Smart Rockets. This is the News You Are Looking For.This is the News You Are Looking For. Be the first to get all the latest on EA Star Wars™ games, including Star Wars™ Battlefront™, as well as other EA games, news, and events. Thank you for signing up. You'll be the first to know all the latest on EA's Star Wars™ games, including Star Wars™ Battlefront™, as well as other EA games, news, and events. Yes, I want the latest news on EA Star Wars™ games, including Star Wars™ Battlefront™, as well as other EA games, news, and events.